That’s right. There was another ship, one that set out from the very same port in Southampton nearly four hundred years earlier and was bound for the same land. This ship also bore many who wished to find new hope in a new land, but there were some differences. Instead of Titanic’s two thousand passengers, this ship could handle barely over one hundred, and instead of elegant ballrooms and wide promenades, this one offered little space for its crew and passengers. In fact, this ship would have fit inside one of Titanic’s many spacious rooms. And far from unsinkable, she leaked profusely and stood a good chance of sinking during the dangerous Atlantic crossing. But the fate of the Mayflower was quite different. After sixty-six difficult days at sea and against the odds, she safely reached her destination. The journey of the Mayflower made headlines as well, but they were of a different nature than Titanic’s. They had voyaged, they wrote, “for the glory of God and the advancement of the Christian faith” and to be “stepping stones of the light of Jesus” in this new world. One ship was confidently hailed as the glory of a new age and man’s achievements. The other set out for the glory of God and the benefit of future generations. The first sank after three brief days of ease. The second arrived safely after sixty-six days of arduous labor and difficulty. Titanic’s name has come to be synonymous with an age of decadence, pride, and folly. The small band aboard the Mayflower helped found a nation. A little over one hundred years ago, she was the talk of Europe, and the newspapers claimed she was the “promise and pride of a new age,” a century still fresh and full of hopes and dreams. She was a marvel to behold. The largest moveable object man had ever made, she was over eight hundred feet long and more than eleven stories tall. She had to bear a name worthy of her stature, and so she did…Titanic. Those who boarded her in Southampton were a sort of cross-section of the age, from the super rich and famous to mere commoners. There were movie stars, government officials, criminals, and those heading west to find a new life in the new world. Anyone nervous about the long voyage might be assured by the architect and builders that this ship was unsinkable, and at least one man boasted that God himself could not sink this ship. And if God can’t sink the ship, you don’t need many lifeboats. There were barely enough for half of the passengers. We all know the rest of the story – the iceberg, the gash in the side of the ship, and how this modern marvel along with over 1,500 of her passengers sank into an icy grave in the North Atlantic. In the wake of this disaster, pastors seized the opportunity to preach against the pride and arrogance of the age and to call for national and even international repentance. There were lessons to be learned from this disaster. Through books, plays, movies, games, articles, and museums the story of the sinking of HMS Titanic has been told and retold for a hundred years, and the lessons from this story are as relevant today as they were in 1912. That age of decadence, overconfidence, and self-indulgence is not so different than our own. But did you know that there was another ship? 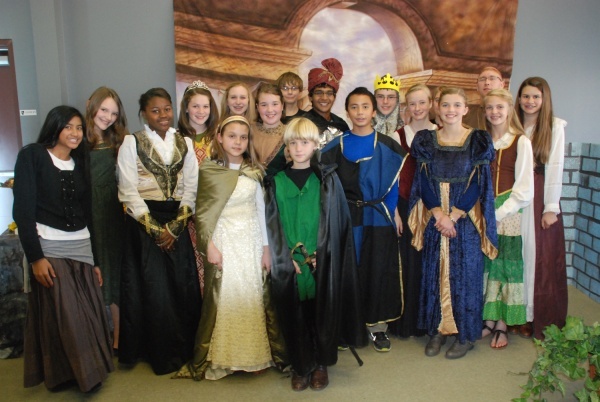 The 4th, 7th and 8th grade classes experienced a “taste” of history last Thursday as they enjoyed a sumptuous Medieval Feast, complete with costumes, decorations, and Medieval food, games, and entertainment. Mr. Vermillion and Mrs. Terrell, along with parents Jolene Monlezun, Elsa Jordan, and Christie Rasberry, planned, decorated, and led the activities. 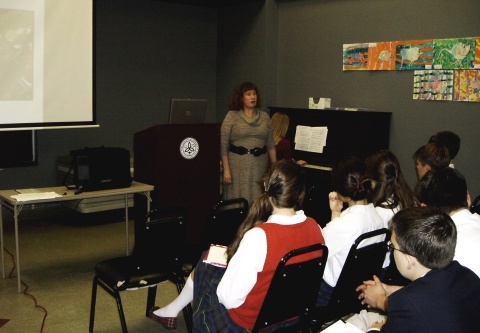 SFA Music Professor Dr. Jamie Weaver visited Regents Academy and presented her lecture, “Pastime With Good Company: The Music of Tudor England,” for the 9th-12th grade students. Her lecture connected ideas and historical personalities with Renaissance music. Dr. Weaver performed several pieces, including one written by King Henry VIII himself. 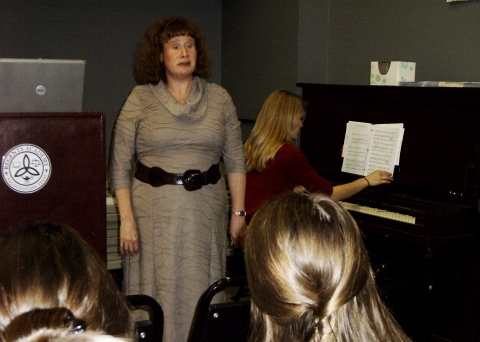 Emily Alders, Regents music teacher, accompanied Dr. Weaver. Students and teachers alike greatly enjoyed her lecture and performances and had a wonderful time meeting her. Thank you, Dr. Weaver! 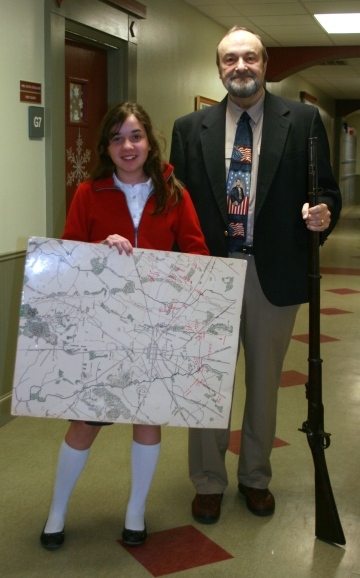 Dr. David Smith, a veteran history teacher who specializes in Civil War studies, visited Regents Academy as a guest lecturer for our Modernity I class (9th-10th grades). He spent three productive days with us, providing a thorough introduction to the Civil War (which is no small chore, considering the breadth of the subject). He did an outstanding job and we benefited greatly from his visit. Dr. Smith is the husband of Regents kindergarten teacher, Mrs. LaWanna Smith. Thank you Dr. Smith! 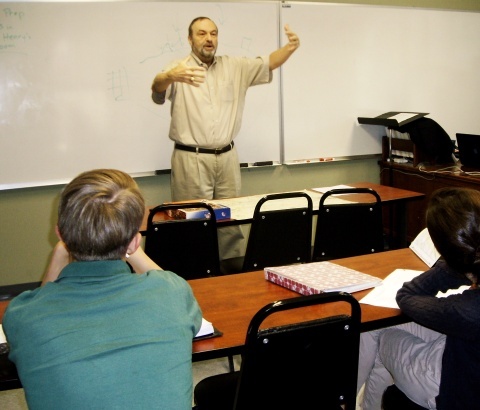 Among my many duties at Regents Academy, I teach the junior and senior Omnibus course each afternoon. I enjoy it immensely because I love being in the classroom with students, and I love literature and ideas. This year we are studying the Medieval millennium and its many worldviews and impacts. Augustine, Boethius, Dante, Machiavelli – the authors we are reading are an honor roll of some of the most influential thinkers of Western civilization. 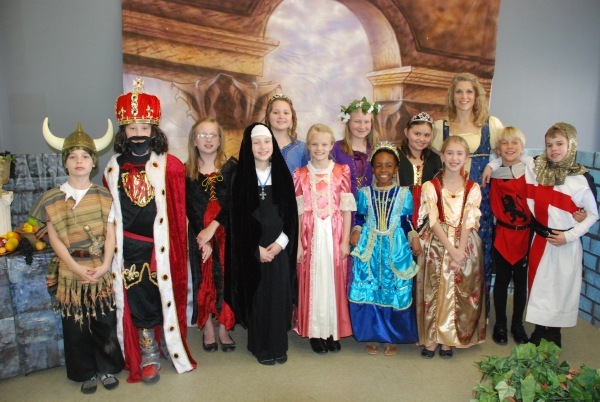 The timeline of events, personalities, and history in our class this year has paralleled the 4th grade class’s study of history as they, too, have focused on the years from the close of the Ancient period to the opening of the Renaissance. Mrs. Katrina Terrell, the 4th grade teacher, and I decided to seize the opportunity of our two classes studying much of the same material and bring them together to work side-by-side on some projects. Also, we decided to team up the classes for a Medieval Feast. Boy oh boy, what a great time! 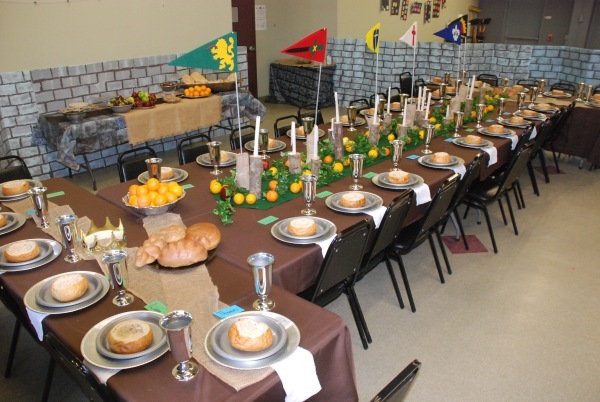 Parents decorated the Great Room as a banquet hall and prepared authentic Medieval food for the students to eat with their fingers in authentic Medieval style. There was a castle cake and a stained-glass window with a knight fighting a dragon. 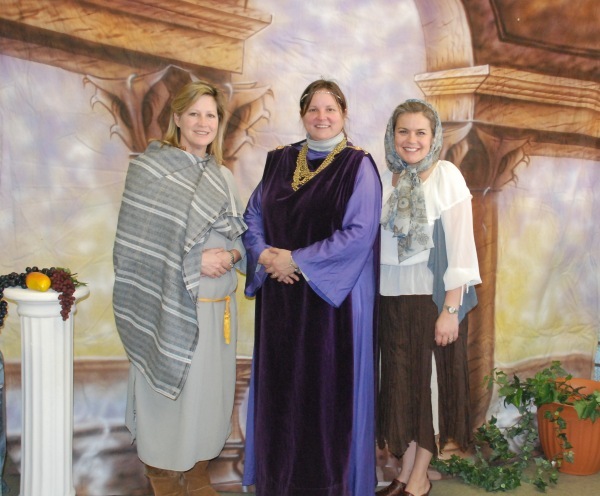 The students came in costume and presented entertainments. 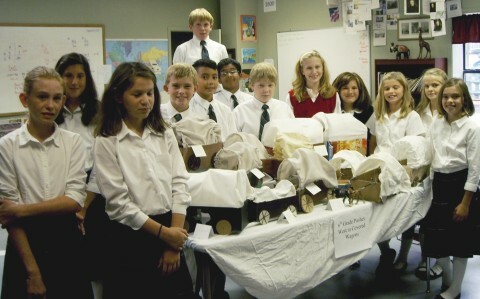 And the students worked together in young-old teams to give presentations on various facets of life in Medieval times. Then after the feast they went outside to play games together. One of the real blessings of the whole event was the preparation for it, when the juniors and seniors teamed up with 4th grades to prepare their presentations. They were like big brothers and sisters (at their best), leading their younger schoolmates and encouraging them to contribute to the presentations. It was a real delight to see them busily and happily at work side-by-side, laughing and discussing Medieval monks, scholars, soldiers, ladies, artists, pilgrims, and lords. As I reflect on our classes’ partnership, Mrs. Terrell and I really are very thankful. Groundwork laid in the grammar school is reinforced and built up on the secondary school; ideas and events come around again, and students are allowed to build on what they know. Regents students really do love each other. Seeing the older students working with the younger students is a treasure. 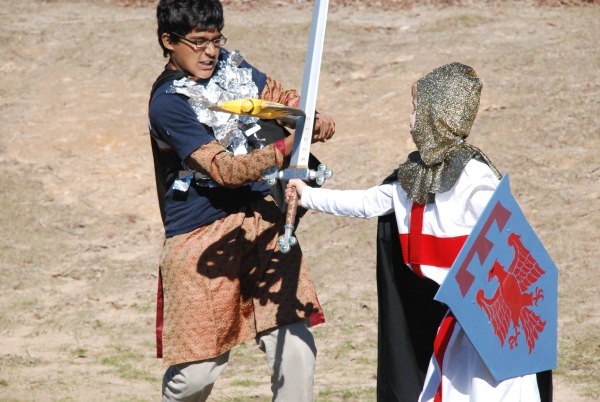 Class events like the Medieval feast are memories that students take with them forever. 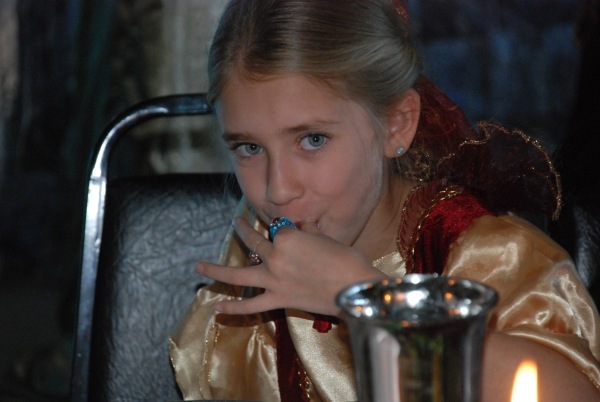 They will remember the day they dressed up in costumes, ate strange food, and feasted in Medieval style with the big kids. And then, too, I am reminded that at our school, school really is about learning, and learning can be fun. Sounds revolutionary, eh? 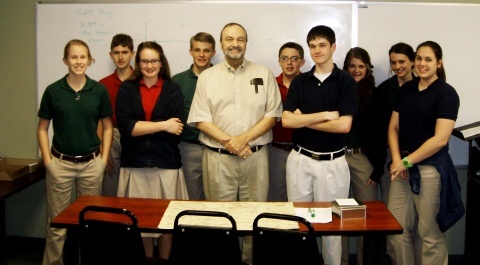 The Spring 2011 Intercollegiate Review included an article called “Four Myths About the Crusades” by Paul Crawford. You can read it at the First Principles website here. Crawford’s article attempts to debunk the prevailing narrative that features the crusaders as cynical, greedy, power-hungry Westerners attacking innocent Muslims. In an era when the relations of East/West, Christian/Muslim, and Anglo/ Arab are front-page material, it is important to think clearly about our history. Our first and second graders caused no little excitement as they entered the hallway decked out in their best Native American and Pilgrim costumes! Instead of eating their regular lunch, the children gathered in the second grade room to feast on a myriad of delicious items ranging from pomegranates to tandori bread and fresh raw carrots to tender smoked ham. Our sweet teachers thanked the mothers and grandmother who had dedicated so much energy into the feast and then the class prayed. The scene was beautiful as my gaze passed from one precious face to the next, thinking about how much the children are loved and prayed for in the tiny little school on the hill. 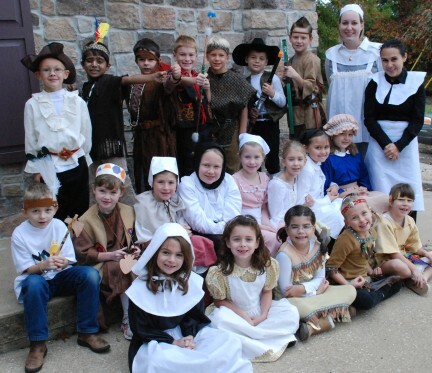 I asked a few of the children, “Who were the Indians and Pilgrims?” One or two pointed around the room, identifying their friends that were dressed as Indians or Pilgrims. One little first grader told me rather matter-of-fact, “The Pilgrims were from England and they came over on the Mayflower.” When asked what they were thankful for, most answered like a good little lad or lass in Sunday School with “God!” My favorite response was the second grader who didn’t miss a beat when he told me that he was thankful for “Tyron!” This particular second grader happens to be my nephew and this wasn’t a name I was familiar with. My puzzled look triggered him to quickly whip out his penpal card. Lo and behold, wouldn’t you know…his pen pal from New Zealand is named Tyron! First and second grade has much to be thankful for as I’m sure you do as well during this thankful season! We enjoy studying history in 6th grade; in fact, we love history so much that I often must remind my class that we should honor each person’s insight and comments for we all want to jump in regularly with our own knowledge or wonderment! Our Veritas cards take us through the early 1800’s right up through Modern America! That’s an abundance of material to cover and it’s my job to make each lesson as meaningful as possible so that my children will retain an appreciation of their roots in our Great Land. We study settlers on more than one occasion but this week’s card was “Westward Expansion,” and the students’ assignment was to create a covered wagon. We worked on our wagons during class for a few days and some of my students took their covered wagon home to put the finishing touches on! Through blistered fingers from the glue gun, pricked palms from the needle that stitched the covered canvas and smocks that blocked straying paint strokes, my students produced some very artistic and sturdy wagons!